Yesterday concluded the first ever JAM Art and Supplies’s Supply Drive. We were collecting beads, rubber band bracelet making materials, and t-shirt decorating supplies for the Children’s Inn. The Children’s Inn is a private, non-profit organization founded in 1977 that provides 24 hour, free services for women and children who are victims of family violence, elder abuse, child abuse, neglect, or sexual assault. I dropped off two heavy boxes filled with more beads then I could of imagined and other craft supplies; these boxes will help fill the time for mothers and children who are seeking shelter from abuse with the pleasure that can only come from using ones hands and being creative. When I dropped off the boxes, Staci, the woman in charge of donations gave me a tour of the high security shelter. I was impressed with the stock piles of commodities that they offer to the guests to ensure they have all the things they need while they’re away from home. Some of the women and children leave the abusive situation without much more than the clothes on their backs. They have clean socks, under garments, and clothes for every size. I asked what things they need most right now and Staci said they’re always in need of luggage and cereal. If you would like to make a donation to the Children’s Inn, here is a link to their donation page. Or, if you would like to learn more about JAM’s Supply Drives contact us! A week ago today was our first board meeting. I meant to write about this sooner, but between helping curate the Art vs Appliance show and having a baby with a fever, I haven’t gotten around to it. I hope you’re not too upset. Every member of JAM, except Ryan, our lawyer on board, was at the meeting. Currently, our biggest challenge is getting the art supplies into the hands of the artists. Someday we’ll have a store front, but for the next year or two we’ll just have to be crafty (ha ha). Don’t worry though; we have a few ideas up our sleeves. The first way we’ll get art supplies into the hands of people that will use them is to just hand them over. On June 6th we have a supply drive collecting art supplies at a clothing store and gallery. 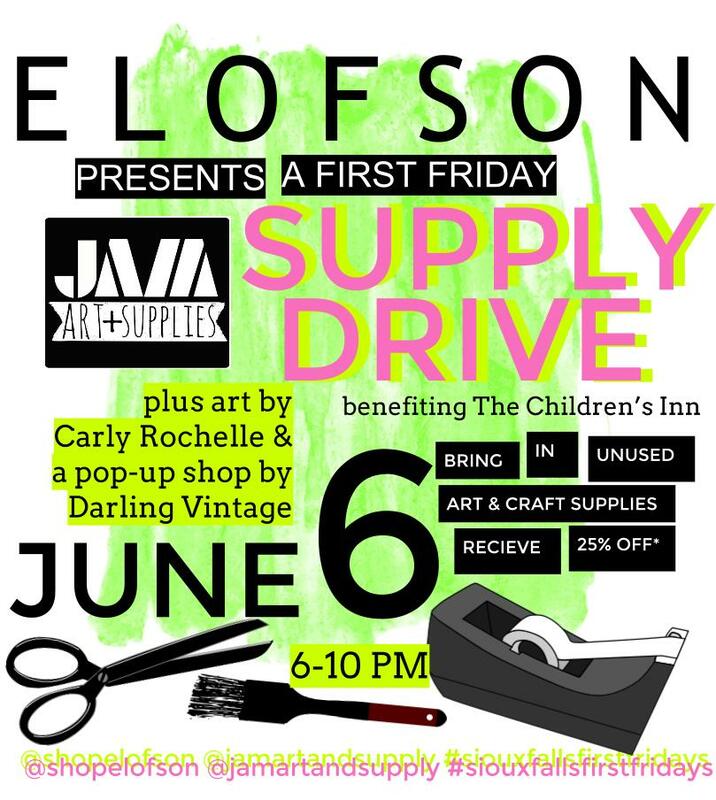 From 6-10 on that First Friday you can drop off your donation of art and craft supplies and see the pop-up Darling Vintage clothing line at Elofson. We will be donating art supplies from this drive to the Children’s Inn. 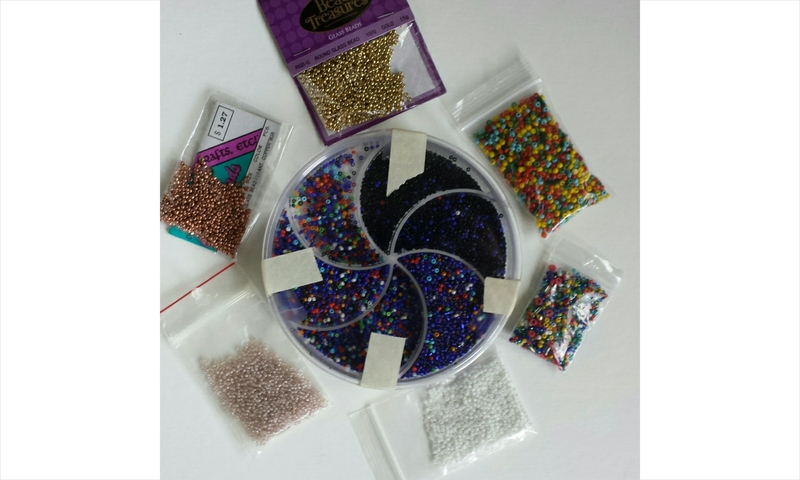 We will be collecting and gifting larger beads that will be for toddlers, plus small beads and supplies for Native beading. Also, in addition to beads, Children’s Inn is in need rubber bands for bracelets and supplies to make 4th of July tie-dye shirts. What a great opportunity to help some kids enjoy their holiday! I’m really excited to get this first project underway, so I’m going to cut this blog post short. But—I’ll let you know that the board meeting left me feeling energized. I’m feeling positive about our Board of Directors. And, we have exciting news about our blog… Stay tuned! It’s happening! It’s finally happening! The weather is slowly prying itself away from winter’s tightly clenched fist and becoming nice enough for us to all get out and enjoy each other. Conversations with friends can finally diverge from griping about the cold to sharing excitement about the new opportunities of spring! The month of May will be rung-in full force, filled with plenty of chances for interacting with your community! 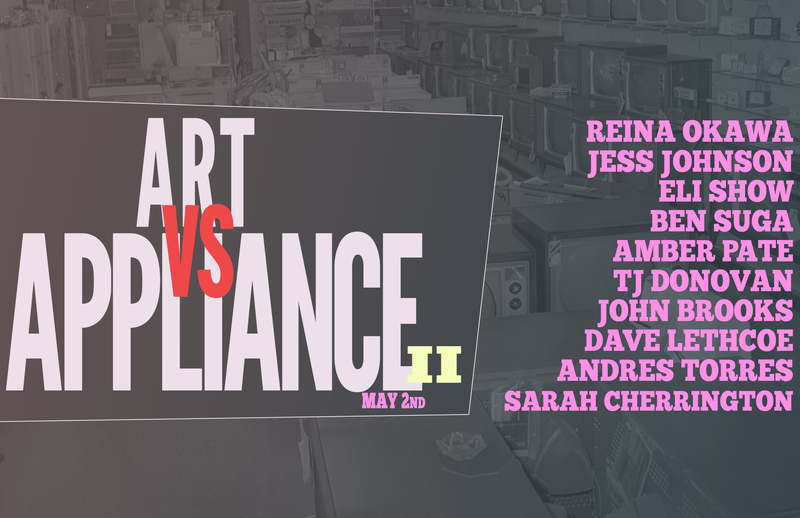 Now, it seems like the upcoming First Friday in May is filled with more than enough art receptions, but I must say, Art v Appliance is definitely not one to miss… And I’m not just saying that because I’m showing my art there. In addition to me, there are nine other artists! NINE! If you have been privy to the drama and politics of the Sioux Falls art scene, you know Deb Klebanoff. If you’re like me, and you kind of just started paying attention, you still might know her. But, If you’re young, or new to the art world of Sioux Falls, you probably don’t. Like most First Fridays in Sioux Falls, this past Friday was full of plenty of options for entertainment in the arts world. Due to the variety, I ultimately was forced to narrow down my choice of events in order to make time to properly enjoy each one. There’s something encouraging about driving down Spring Avenue. Maybe it’s the old houses, but tonight the familiarity of the street gave me the courage for this first blog.